Rinse the rice thoroughly with water to remove any excess starch. Soak the rice with plenty of water for 30 minutes. You can do this in a separate bowl or the pot you are going to cook the rice in. Add the soaked rice to the pot. Add 2 cups water, salt to taste and a splash of oil. The oil will help prevent the water from boiling over which is caused by the starch in the rice, and some people say it also adds flavor. Bring to a boil under medium-high heat, uncovered. When it starts boiling, cover and lower the heat to low. Cook for 15 minutes. After fifteen minutes, take the lid off. If there is any excess water, allow it to boil off. Fluff with a fork, you are done. 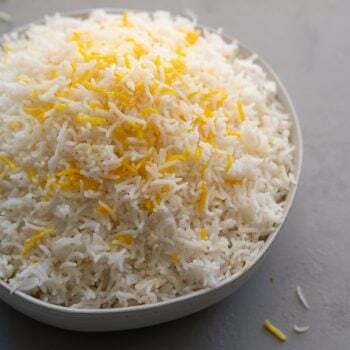 Saffron: Start this option before you start cooking the rice. Warm one tablespoons of milk or water (I usually use the microwave). Crush the saffron with your fingers and add to the warm liquid. Let sit for 15 to 20 minutes. When the rice is ready, mix with a handful (about a 1/4 cup) of cooked rice. Then mix this colored rice back into the white rice. Turmeric: Mix about an eighth teaspoon of turmeric with a tablespoon of water, then adding a handful (about 1/4 cup) of some still hot rice to your mixture. Then mix this rice back into the white rice.